The Universal Driver Interface is built upon the .NET Standard 2.0 Framework, allowing it to be deployed and run on Windows, Mac, Linux, Android, iOS, and even Raspberry Pi* platforms. This opens up unlimited integration scenarios for the OAS Platform, allowing for new edge computing solutions and device connectivity. The OAS Platform ships with built-in native drivers for many devices such as Allen Bradley, Siemens, and Modbus PLCs. Connectivity can be configured using the OAS Configuration tool, exposing real time data and control to the Platform. Once connected, each device’s data can be shared over any network between other installations of the OAS Platform, providing a great deal of flexibility in deployment and data aggregation. The UDI SDK allows developers create new and customized integrations that may not be possible with the built-in device drivers. Using the SDK, a developer writes custom code to read and write data against any external API or protocol, exposing these data points to an OAS Server. The UDI implementation is written in either C# or VB.NET against the .NET Core 2.0 Framework, and depending on the desired deployment target, can be deployed as a Windows Service or application to be run on any other supported platform. Additionally, the UDI implementation can be deployed either on the same machine as the OAS Server if written as a Windows Service, or it can be deployed remotely on another Windows PC or server. If the UDI implementation is written as a .NET Core application, it can be deployed as a Mac or Linux application and installed as a persistent background process. If desired, a UDI implementation can also be written using Xamarin and deployed as an Android or iOS application. The .NET Standard is a cross-platform, baseline version of the .NET libraries. The UDI is built to support the .NET Standard 2.0, allowing for device drivers to be written for any platform supported by the .NET Standard. 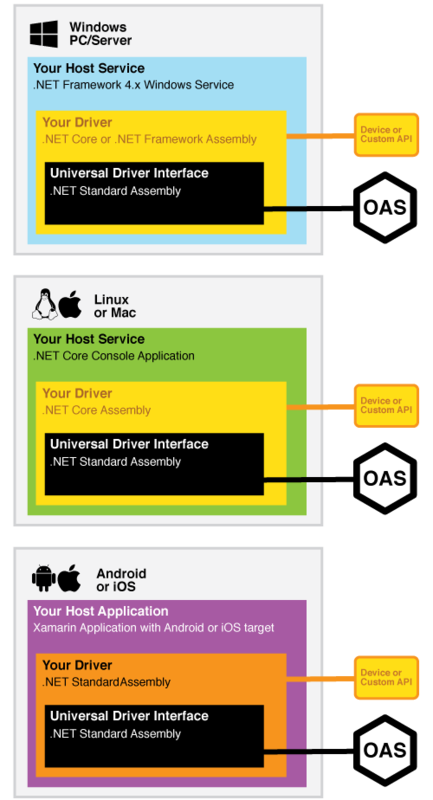 Developing Your Driver as a .NET Core or .NET Standard Assembly will allow for the interface to be reused on multiple platforms without the core code being recompiled. A “wrapper” application or service can use the assembly with each deployment target and use case having it’s own custom wrapper. This can be a Windows Service, a console application, or even mobile app. *While Raspbery Pi is not technically supported as a deployment platform by MS, the Raspbian OS is a variant of Debian, which is a supported target.